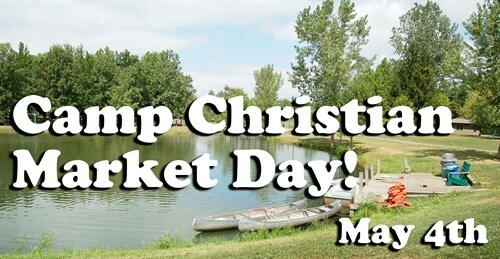 We are excited to host the inaugural Camp Christian Market Day on Saturday, May 4th from 10am – 4pm. Join us at Camp for a fun-filled day featuring a variety of arts & craft vendors, home businesses, and yard sale booths. PLUS fun activities like boating, hayless hayride, yard games, and more!! and enjoy a beautiful spring day at Camp Christian!! Help us support Camp Christian’s life-changing ministry. Sign up to sell your items or bring your church group, youth group, book club, families, friends, or just treat yourself to a day out. There will be concessions sold for lunch and snack items throughout the day to benefit Camp Christian. You may even be able to get a Camp Christian Klondike!! EXTENDED EARLY BIRD SUMMER REGISTRATION! Register your child for one of the Camp Christian Summer Camps or Conferences onsite at the Market Day, to receive the special extended early bird registration rate. If you are interested in selling your items at the event, please fill out the separate Vendor Application form. Proceeds from vendor fees will go directly to Camp Christian operating funds, which helps prepare Camp for Summer Programming. As we get closer to the date, more details will be shared through this page and on the Camp Christian Facebook page @OhioCampChristian.